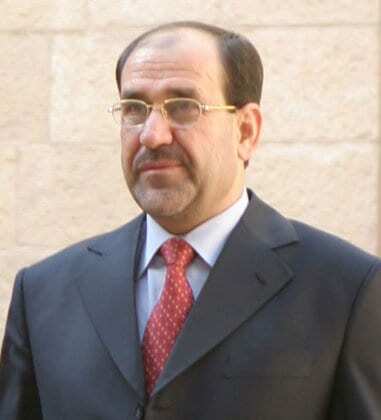 Iraqi’s Prime Minister Nouri al-Maliki will visit the White House today, November 1, 2013. The Coalition for a Democratic Syria (CDS) is calling on President Obama to confront Prime Minister Maliki on his government’s overt support of the Assad regime. The Iraqi government has offered both direct and indirect support for the Assad regime’s war against the Syrian people. Secretary John Kerry has requested that the Iraqi Government ground flights that go through their airspace for inspection. Senator Kerry wants the Iraqis to ensure that flights from Iran are truly carrying humanitarian aid to Syria rather than weapons and other nefarious items to support Assad’s on-going assault to kill. According to The Guardian, Secretary Kerry said, “I made it very clear that for those of us who are engaged in an effort to see President Assad step down … anything that supports President Assad is problematic,” following a private discussion with Iraqi prime minister Nouri al-Maliki. On Sunday, Rep. Mike Rogers, the Michigan Republican chairman of the House Intelligence Committee called for a greater US presence in the Syrian conflict to prevent chemical and conventional weapons from falling into the wrong hands. He said the US should create a “safe zone” in northern Syria that would give the US more leverage with opposition forces. What a brilliant idea! Syrians have been asking for safe zones for more than two years. Rogers’ comments reflect an increasingly frustrated US Congress that sees unrest in Syria as dangerous to US interests. Now after 100,000 deaths and unknown numbers of Syrians arrested and tortured, it sounds like the US Congress may have some common sense after all. Last week, Senators Carl Levin and John McCain asked Obama in a letter to step up US military efforts in the region, including destroying Assad’s aircraft using precision airstrikes. Senator McCain has had his eyes wide open for a long time regarding Syria. To have these two well respected bi-partisan Senators asking for action could make the idea begin to resonate. On October 31st, Al Arabiya reported that a US source said the Israelis destroyed a shipment of surface-to-air missiles (SAM) located in Latakia, Syria, that was headed for Hezbollah in Lebanon. The Britain-based Syrian Observatory for Human Rights reported that a series of explosions took place on Wednesday near Latakia, the stronghold of Syrian President Bashar al-Assad. “Several explosions were heard in an air defense base in the Snubar Jableh area,” said Observatory director Rami Abdel Rahman. He said the cause of the explosions is “unclear” and that no casualties have been reported. In May, Israeli jets reportedly destroyed a stockpile of Iranian missiles in Syria bound for Hezbollah. Saudi Arabia has submitted a draft resolution to the UN General Assembly’s “Third Committee” today (October 31st) to “uphold its responsibilities” in bringing those responsible for war crimes in Syria under international criminal justice. The Kingdom “encourages the Security Council to consider appropriate measures to ensure accountability in Syria and stresses the important role that international criminal justice could play in this regard,” the draft resolution said. Important language in the Saudi document condemns the presence of foreign fighters in Syria, particularly those backing Assad, such as Hezbollah. The condemnation certainly extends to Iran’s foreign fighters as well. Additionally, it calls on the Syrian regime to abide by the UN Security Council resolution to dismantle its chemical stockpile. The resolution also demands that Syrian Authorities lift blockades on humanitarian aid and relief operations; and to release all “persons” arbitrarily detained. A vote can be expected within the next two weeks, however, the UN has not defined a specific date for the vote. The UN General Assembly’s “Third Committee” deals with the social, humanitarian affairs and human rights issues. On November 1st, Syrian Activists will rally against Iraqi Prime Minister Nouri al-Malaki at the White House. Syrian activists and supporters will come together on Friday at 10 am to send a message that supporters of the Assad regime are not welcome in Washington D.C. Anyone who stands up for the People of Syria is welcome at the rally. The unfortunate result for this scenario is more innocent deaths, starving children, refugees and chaos.